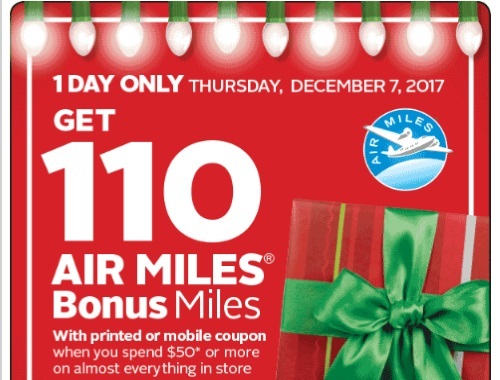 Hot one day Air Miles coupon! Get 110 Air Miles Bonus Miles when you spend $50 or more at Rexall Pharma Plus! This coupon is valid for one day online, today, Thursday, December 7, 2017. Show the coupon on your mobile, or print it to show the cashier. Also, don't forget the $5 off $25 2017 coupon from their customer survey here.